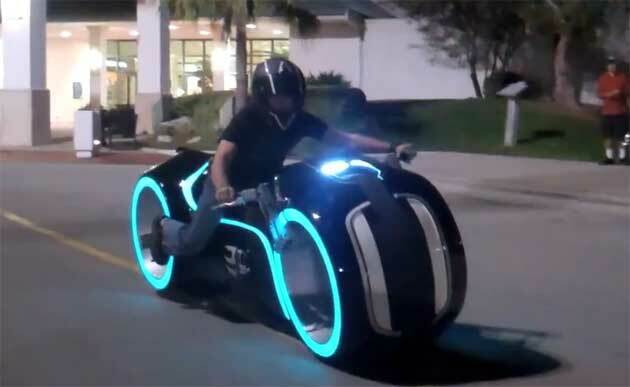 It was only a matter of time before someone bent the full brunt of their mechanical might toward creating a full-scale, operational version of the light cycle from Tron: Legacy. That someone just happened to be the crew from Parker Brothers Choppers. Using lithium-ion batteries and a 96-volt electric motor, the guys built a real-life version of the bikes made famous by the first Tron. If that's not enough to pique your interest, they're also giving one of the bikes away to one very lucky fan. If you want to claim a light cycle as your very own, all you have to do is craft a brief, three-minute video describing why you deserve to take the cycle home as your very own, don't do anything illegal or dangerous while filming it and get chosen out of the hordes of other sci-fi fans itching to get their paws on the machine. It's that simple. Hit the jump to check out a video of the light cycle whirring around a mall parking lot, and head over to the Parker Brothers site for more information on the giveaway.